Studies show that Sepsis accounts for more hospital readmissions and associated costs than any other condition. 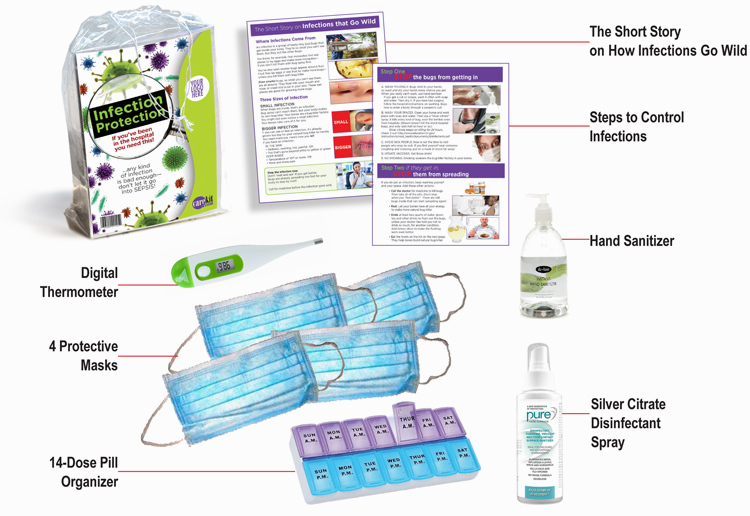 The Infection Protection Care Kit teaches patients how to recognize an infection before it goes to Sepsis. It simply and vividly explains the threat of infection, how Sepsis works, and has tools to help prevent it. Perfect for any patient at risk. I love the “infection gone wild” concept to educate patients about sepsis! We need this kit! People see signs all the time that say, “WASH YOUR HANDS.” But the studies show they don’t. They think they can just tough it out. I hear, “no big deal.” They’re so blasé about it, they don’t even listen when you try to explain the real danger is in their own, internal body’s immune system response. They think they already know everything they need to know.